I've got an update for you on the vision system cliffhanger... tomorrow. 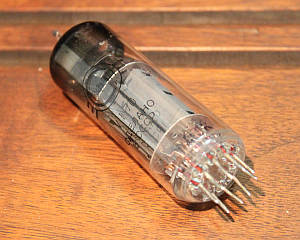 Today, let's talk about vacuum tubes. In need of a bit of a break from robotics, I decided to tackle troubleshooting my Knight KG-250 vacuum tube (valve) amplifier. With a new set of "Winged C" Russian 6Ф3П (6F3P) output tubes installed (equivalent to the stock 6BM8 tubes), I fired it up and... oh no! Red plating! That's bad! What the heck is red plating you may ask? It's simply thermal overload of a tube, manifested visually. Being housed in glass, you can see the guts of vacuum tubes. The guts are metal: plate (anode), grid, and cathode. When too much current is drawn through the tube than can be dissipated, the metal parts get very hot. Red hot. Literally dull cherry red hot. The visible, outer plate glows red. Hence, red plating. That much heat reduces the tube's lifespan significantly. Being a solid state kind of guy, the world of vacuum tubes is a little bit foreign but somewhat familiar, too. We know about anodes and cathodes from solid state diodes. And we can understand your basic tube as roughly analogous to a Junction Field Effect Transistor (JFET). Voltage controls the current flow. And there are still resistors and capacitors in the circuits. Basic electrical troubleshooting still applies. But there's a twist. Most of the old tube gear uses point to point wiring, rather than printed circuit boards. The machine had been previously refurbished, with new capacitors and resistors on the power supply and amplifier circuits. So verifying the wiring of components to the output tube sockets was the first troubleshooting task and it immediately revealed several big wiring errors. 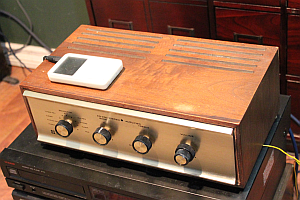 Once fixed, the little amplifier powered up and played music -- no redplating! Yay!